Due to severe sun and food allergies, Zack Thomson has had to live in a mental ward in the eight years since his father died, leaving him an orphan. It's a quiet, content life, but when a burly man on a motorcycle comes barreling in one night, telling Zack to run, his whole life is turned upside down. He learns the scary truth about his father, an uncle he never knew he had, and what he really is. Night Runner is a vampire tale like no other, focusing on family secrets, danger, and choosing what is right rather than the romance and fluff. Zack's character is very easy-going, and his down to earth personality and search for the truth makes him a very likable character. Turner's writing style can be somewhat blunt and jerky at times, and his focus is on the action, something that will most likely appeal to reluctant readers. 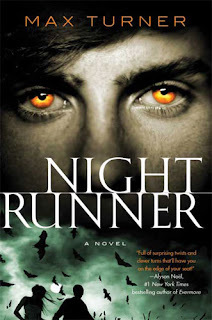 The ending seems a bit hurried, and leaves you expecting more, but overall Night Runner is a great suspenseful read; fast-paced, mysterious, sometimes a little morbid, and funny in parts. This is a thrilling vampire read, and it will keep up late with Zack and his friends. Cover Comments: I really like this cover--it's very creepy and in your face! The colors in the sky at the bottom are very ominous, and the bats are a creepy touch. The model's eyes are really unusual and great. This is one cover that is sure to pop in the bookstore! I like seeing how different authors approach vampirism, especially when it's really original. The atypical ones that pop out at me? I have this book for review and I was worried I wouldn't like it. Thanks for making me excited to read it! sounds interesting. May have to look into it. This looks and sounds great! Gonna add it to my wish list! This was a FANTASTIC book. I loved every second of it. This had me wanting more. Louder Than Words Video Chat!